Like you, I am an avid reader about the Civil War. 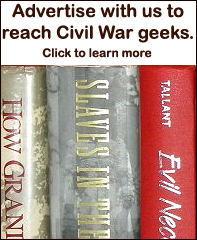 My library on the Civil War consisits of over 4200 books, so I guess that qualifies me as a Civil War Geek. Please add me to the club. Thanks Andy, where you from? Do you have a blog or web site to let us know about? Do you want to be a lead-reviewer, panel or both? Sign me up. Lead reviewer type.